So, the Australian 2009-2010 Federal Budget is delivered. ‘Clean energy’ stands as one of the infrastructure centrepieces – an investment that is hoped to both pull the economy out of recession and get us on the pathway to a low carbon economy. A princely sum of $4.5 billion directed to renewable energy, infrastructure for climate observing systems, and funds for low emissions technology development. It sure sounds imprressive, but under scruity, it turns out to be mostly just smoke and mirrors. Breaking down the numbers, we find that $1 billion is a rollover of existing funds, while $2.4 billion has been directed towards research, development and demonstration of low-emissions coal technology (that’s ‘carbon capture and storage’ for those not au fait with its prefered euphemism). A little under half a billion will go towards establishing a body to support research into renewables. I’m ambivalent about the large bucket of money handed to coal. There are severe technical and logstical constraints on ‘clean coal’, which mean that it can never be scaled up to become a major global solution to carbon mitigation.Yet the technology, if developed to maturity, has the potential to be used to drag carbon dioxide out of the atmosphere and lock it away underground – if power generation furnaces are fed by biomass rather than fossil fuels. So in a future ‘geoengineering’ role, it remains a promising approach that is worth supporting. The trouble is, it can be so easily used to ‘greenwash’ the rampant expansion of coal use today, while the climate system becomes increasingly, and perhaps irreversibly, hostile to our modern society and the planet’s biodiversity. As to the investment in renewable energy such as solar power, I’m honestly not sure what value add we’re getting out of this budget. The mandatory renewable energy target (MRET), which will commit Australia to produce 20% of its electricity from renewable sources by 2020, is already going to drive major investment in renewables through carrot-and-stick incentives. What is this budget doing that the MRET legislation won’t already do? Almost certainly nothing. One practical measure, which I support, is the commitment of $228 million to double the capacity of Adelaide’s Port Stanvac desalination plant, giving it an annual output of 100 gigalitres. In my view there is no real prospect that Australia’s major cities will ever again break their chronic water stress – and restore some decent quanta to environmental flows – unless a technological solution like desal is adopted across the country. Desert states in the Middle East have been doing it for years. The key climate consideration is to have that desalinated water produced from low carbon energy sources. Unfortunately, the paltry commitment to low carbon energy rollout in this and previous budgets, coupled with the flawed design and inadequate targets of the CPRS, means ‘carbon-friendly’ desal remains a pipe dream. Comments and thoughts on the environmental, climate and energy aspects of the budget are welcome. It’s disappointing that a federal government elected on a climate agenda can stoop to the copout of ‘cleaner coal’. However the 20% MRET by 2020 could be more powerful than a weak carbon cap. For example the push to gas fired generation could meet a mild carbon target but gas is not strictly renewable. Nor is nuclear. Maybe some new form of Orwellian doublespeak will be used get around that difficulty. The big question with desal is should those parched cities with over a million people disperse to smaller communities? At say $1 per kL the water is too expensive to grow food. Recycled effluent can grow a few tomatoes but big cities need a natural food bowl nearby. One advantage of desal is that warmed water that passes through the primary cooling system of thermal plant may need less energy for subsequent reverse osmosis or flash distillation. However the good people of Port Stanvac, Kurnell, Kwinana or Wonthaggi clearly don’t want any new power station next to their desal. It will be interesting to see just how much of the power needs can be truly accounted by renewables. The mandatory renewable energy target (MRET), in the early years, will mostly drive wind farm construction. This direct subsidy for solar will almost certainly go into solar thermal power, hopefully with storage for 24 hour generation. As such, its the sort of direct targeted technology support that helps ensure the development of multiple options that address climate change. Direct technology subsidy is one of the policy initiatives that Nicholas Stern highlights in his UK government Climate Change review. Stern argues that support of this nature is necessary in addition to a price on carbon (effectively an MRET is a mix of a direct intervention and a carbon price). That’s a good point — the MRET is indeed likely to capture mostly wind and some PV, as well as soaking up all the solar hot water RECs. It seems that 1.15billion of the 1.5B for 4 solar energy demonstration projects is new money. This should provide 150-200MW of average power but more like 300-600MW of peak afternoon power in summer. If SA manages to get a good slice of this they will be getting >25% electricity from renewables. What an opportunity to get BHP to match some of the solar investment and have a combined solar power and desalination plant on the coast, and close down Pt Augusta’s brown coal plant. Power in the day from solar,with enough left over to help with A/C in summer, power at night from wind when less demand from Adelaide. This would be the perfect location for the first nuclear reactor sharing the same molten salt heat storage and steam turbines. I’ve done what I hope is a fairly comprehensive summary of the climate-relevant parts of the budget (comments welcome). I found $6.9 billion committed to RD&D spending (in programs ranging from 3 to 10 years), $3.4 billion of which had been previously announced. In the area of energy efficiency, I found $5 billion (in programs ranging from 1 to 5 years), $4 billion of which had been previously announced. The biggest areas of new spending are, as you mention, carbon capture and storage, up from $400 million to $3.4 billion over 9 years, and large scale solar, up from $135 million to $1.5 billion over 6 years. Importantly, the technology-neutral Renewables Australia fund gets only $465 million, up from $365 million of existing funding. This is a government that is clearly not afraid to “pick winners” when it comes to green (or at least, greener) technology. I strongly disagree with your comments about the MRET making R&D funding redundant. The MRET alone will lead to a deployment of existing technologies in their current state. It will not stimulate the R&D investment required to substantially lower the cost of these technologies, or bring newer, less mature technologies into the mix. The same can be said of market based measures like cap-and-trade or a carbon tax – market forces alone are not enough to stimulate innovation on the scale required. The Stern Review Chapter 16 and Garnaut Review Chapter 18 both do a good job of summarising research in this area. Yes, okay, I buy that argument that the MRET will not be an effective driver of R&D in new renewables like CSP or geothermal — it will have more impact on roll out of mature renewables like wind. Point well made. I agree the Pt Augusta brown coal stations (540 and 240 MWe) should go but any new thermal plant should be on open coastline. The top of Spencer Gulf has elevated salinity and poor currents. Swimmers notice they float higher in the water then feel scalded after emerging. Both the proposed Pt Patterson solar desal plant and the Pt Lowly x-powered desal to serve Olympic Dam are in the wrong stretch of water. In fact Roxby Downs, Whyalla and Pt Augusta now probably need more water than originally planned. If PA and W disconnect from the River Murray pipeline it will free up water for downstream users like Adelaide. The problem will be getting 24/7 energy to run these big desals and pump the fresh water hundreds of kilometres. I’d always heard that equipping houses with rainwater and grey-water systems was far more cost effective than desal plants. I couldn’t tell from this, but does Australia do utility rate decoupling, i.e., incenting utilities directy for efficiency, rather than GWatts? Mostly I think the utilities just greenwash with energy saving tips. I’ve heard of two power companies that want to get into aggressive demand management via remote radio or internet switching of air conditioners. Presumably blackouts or brownouts mean some big customers have to be compensated. This is fear of penalties, not really decoupling of profit from energy units sold. Not that I’m aware of John, but I’m happy to stand corrected. From my understanding, rainwater tanks work out to be considerably more expensive than desal — but are less energy intensive, of course. Grey water re-use for gardens, flushing toilets etc. is a ‘no brainer’. If I had to pick the best *single* thing that can be done quickly, decoupling is #1, as described by Peter Darbee, CEO of Pacific Gas & Electric last year at UN. Among other things, it aligns utilities with efficiency, rather than FF vendors. Darbee says (to state PUCs): don’t expect anything much to happen until you do this. PG&E says this and they mean it. Not sure if you heard about the National Energy Efficiency Initiative – http://www.environment.gov.au/minister/garrett/2009/budmr20090512h.html – announced in the budget. At $100m its still in the demo size scale of things. It picks one regional town/centre and brings together utilities, gov & business to basically do a smart grid prototype with ‘intelligent’ appliances, sending price data, etc. I’m hoping they’ll choose Ballarat, where I am. Then I can justify buying an electric car, recharge the battery overnight from the flotilla of wind turbines surrounding the city and feedback into the grid during the day. I’m particularly looking forward to the middle of the January heatwaves when my PVs are pumping and the tariff will be sky-high. I wonder if they’ll manage to incentivise micro-generators like me by passing on the real spot price? To get onto the NEM I think you need to bid megawatts in 15 minute blocks. I think that cuts out entitlement to FiT. Also the EVs would be scooters not cars. 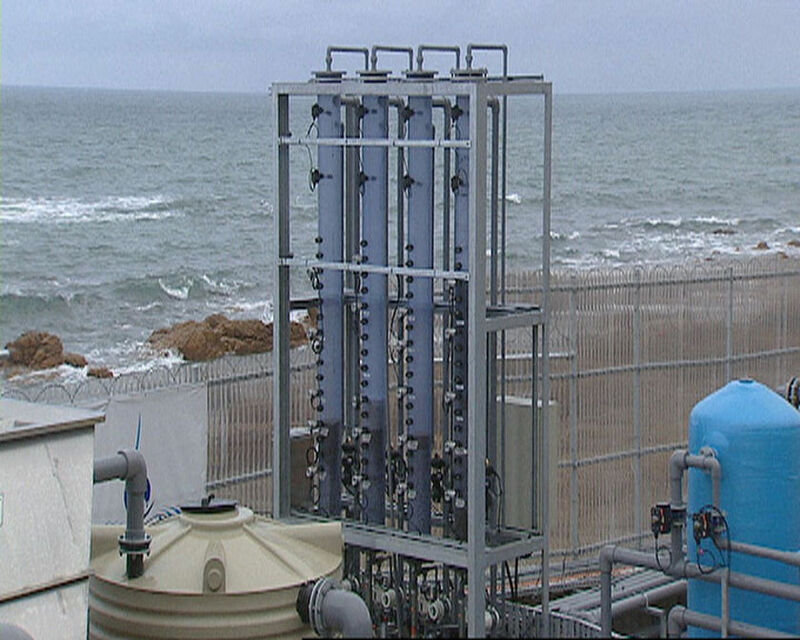 Are people aware of the ammonia-carbon dioxide forward osmosis desalination technology being developed at Yale University? This has the advantage of requiring only low-grade heat (58C), and has potential for being done on a large scale using straightforward solar heat collectors and some mechanism for heat storage. The technology is at the scale-up stage and is claimed to be dramatically cheaper than reverse osmosis, perhaps cheap enough for use with high-value horticulture. Combined with salt disposal via evaporation ponds, it would seem to fit well with South Australia. The SA Water RO plant, meanwhile, has serious likely problems of brine disposal in a shallow, confined gulf. Sounds interesting. Got a link?